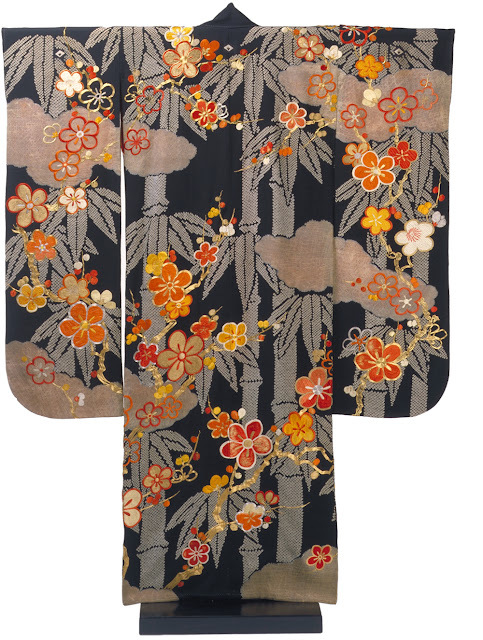 The striking pattern of this kimono reveals the dynamism of Japanese textile design in the early 20th century. 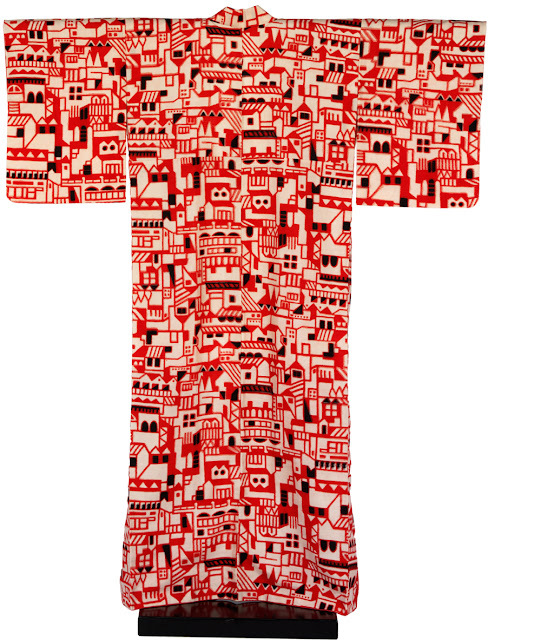 A traditional motif of pine trees, plum blossoms and clouds has been dramatically enlarged, the bold design reflecting the confident spirit of the period. The pine trees have been executed in a method of tie-dyeing called shibori, while the plum blossoms are lavishly embroidered in orange, yellow and gold. These auspicious motifs and expensive techniques suggest this may have been a garment for a very special occasion, or perhaps that the young woman who wore it was a geisha. Many early 20th-century kimono are made from meisen, a fabric woven from silk obtained from defective cocoons. The introduction of mechanised spinning technology meant it was possible to use this lower-quality silk to create a thick, lustrous material that was both long-lasting and relatively inexpensive. 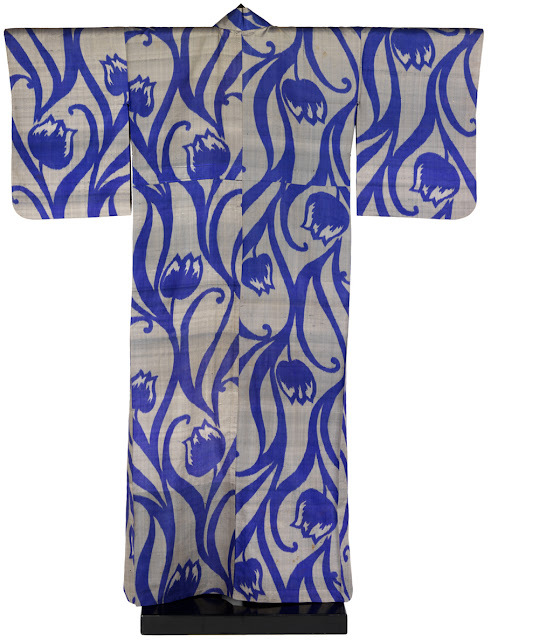 Patterned with chemical dyes using an innovative direct-dyeing technique, meisen became the fabric of choice for women's fashionable, casual kimono. In this garment a western and thus quite exotic motif, the tulip, has been rendered with limited but striking colours in a bold arabesque design. The early 20th century saw the introduction of new textile techniques in Japan which speeded up traditional hand-tied resist-dyeing methods. Chemical dyes mixed with rice-paste were applied through stencils to the warp (longitudinal) and/or weft (horizontal) threads prior to weaving. Stencil-printing both warp and weft allowed for the creation of complex images such as the buildings that decorate this kimono. The dense pattern and limited colours create a very modern, almost abstract effect.